Today's posts will focus on Miltos Sachtouris' "Poems (1945-1971), a finalist for the 2006 National Book Critics Circle Award in poetry. "Reading his poetry," translator Karen Emmerich has noted, "one sometimes has the impression that Miltos Sachtouris was unable or unwilling to wake from the nightmare of history." The work in Poems (1945-1971) is more than a little harrowing. Here, hungry phantoms sit in chairs and weep while oranges crash suddenly through our windowpanes. Words "pierce the head like nails" and flowers devour bees. Instead of snow, glass falls from the sky while, at night, "the moon rose / a carnival moon / full of hate / they tied it up and threw it butchered / into the sea." Written against a backdrop of twenty-six years of national strife, civil war and dictatorship, Sachtouris’ poems suggest a poet who sees the world through the transfiguring lens of political upheaval. His writing, however, is neither didactic nor merely political. Instead, one hears in these poems an intimate voice describe a national landscape in the language of symbol and terrifying, often surreal, imagery. Unsettling and beautiful, these poems, which comprise Sachtouris’ first nine books, grow out of Greek history, but are never restrained by it. they forget all about it. 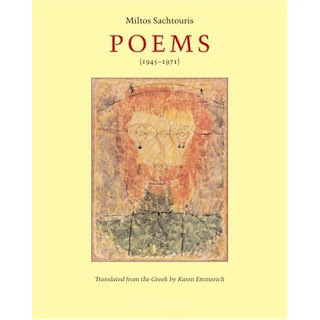 "Miltos Sachtouris’ Poems (1945-1971)" was posted February 07, 2007.